You are here: Home / DIY & Crafts / Decorate Your Shelves Like a Pro! 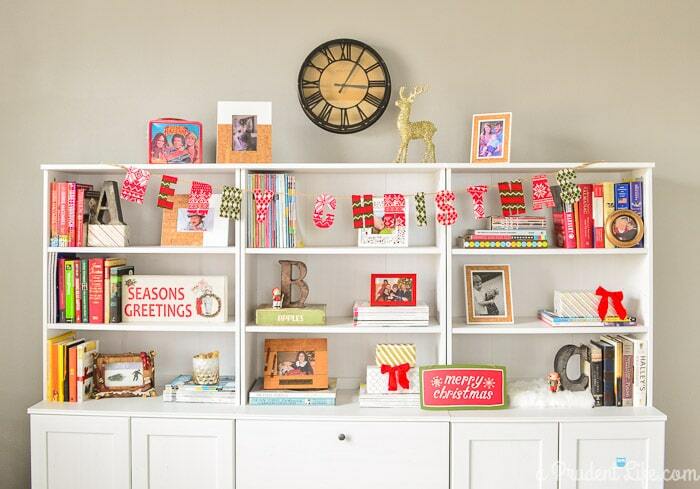 Decorate Your Shelves Like a Pro! I find the concept of decorating bookshelves a mixture of fun and intimidating. Once you break it down into a few easy concepts, the intimidation factor goes WAY down. I thought it would be fun to put together a few visuals to help you the next time you need to update your bookshelf decor. But first, let me show you what I was working with. I’ve been doing slow improvements to our office over the last year. Even though I recently gave my desk a pretty update, the bookshelves have been having an identity crisis. Here’s what they looked like until mid-January. Eventually, we got all the Christmas specific decor put away, but it seemed early to bring out Spring & Summer colors. So the shelves just lingered, half empty. 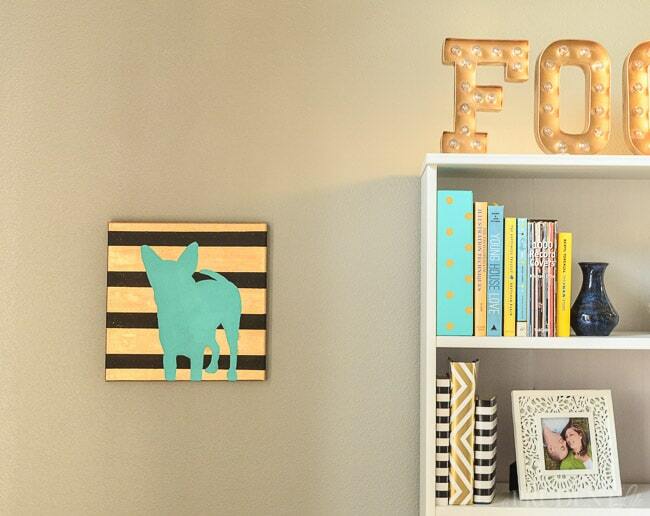 In February, I did some quick staging on two shelves so I could photograph my DIY Pet Silhouette project. The little sections below were the only ones that looked decent! Cropping is a blogger’s best friend. Today it was finally time for me to tackle the rest of the unit! The simple key to having well decorated shelves is BALANCE in every direction with both color and weight. Think of it as a fun puzzle to solve. In this little puzzle, bonus points are awarded if you work in metallics, natural textures, and fun items that are personnel to you. I used gold as my metallic, and spread my gold items across a diagonal pattern. Your eye starts on the big marquee on the upper left, then works its way down to the small owl on the lower right. I added texture and color with pink flowers. Having one on each row creates balance with both the color and the natural element. Even the breathing room can be balanced. Add interest by staggering items away from the edges. Make sure that you are including pieces unique to your family. As tempting as it can be to buy new things to fill shelves, it is even better to save money by using existing mementos. On the top left, I have a pretty cream and gold candle my sister-in-law got me for Christmas (Thanks Sally!). Right under that, there is a trio of blue vases that our uncle made. The ABC bookends came from a shop in Salt Lake City. I got them during my first blog conference. The ultimate art piece is on the bottom right – my husband’s awesome Dukes of Hazard lunchbox – direct from his childhood. In addition to mementos, you can make DIY items to fill your shelves. The FOCUS marquee, books covered in wrapping paper, the rope & flower frame, the burlap & flower vase, and the gold owl were all DIYs. The owl was a white $1.49 find at Old Time Pottery and just needed a coat of paint to be transformed. The rest of the shelves were filled with books (imagine that on a bookcase! ), magazines, and family photos. Since we have closed storage as well, I switch out some of the displayed books from bright colors to red and green between Christmas and the rest of the year. The ones we use stay out, but changing others is simple free decor! Using some of the magazine and books stacked instead of standing up is another free way to add interest. I attempted a little animation showing all my little tweaks as I tried to find the perfect balance. Hope it works! If you thought these tips were helpful, I’d love you to pin the graphic below to help spread the word that it doesn’t take money or a design degree to come up with a beautiful display for your home! I just love a little touch of whimsy and that lunchbox is perfect! Yeah!!! So glad it was helpful! Wow – what a great surprise! Thank you Amy! That sounds gorgeous, but I know what you mean about it looking like a store. 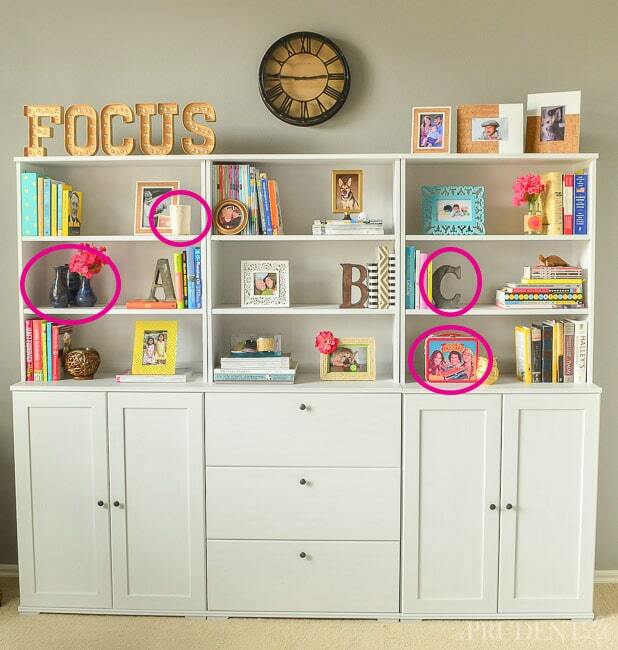 I’d try filling in the bottom shelves (bottom 3 if there are 6 shelves) with books first, and then doing decor on the top sections. That will give it some grounding and make it less like items are just floating on all the shelves. You can mix more books into the upper sections as well, mixing some laying down and some “normal”. 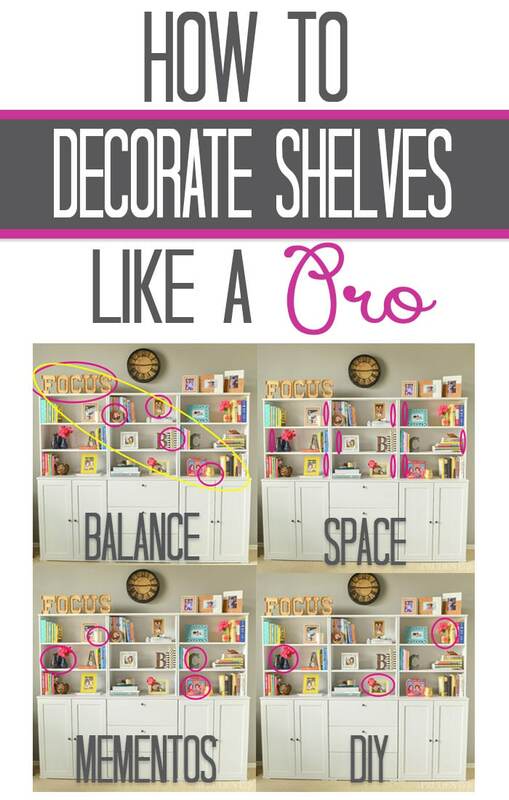 As far as how many items on each shelf, I’d try to mix that up so they aren’t all the same. Some may look great with one larger vase in the center and others will need more of a mix.